Lush greenery separates the two different looking sides along the coastline of Motuarohia (Roberton) Island on the North Island of NZ. From the track above Motuarohia (Roberton) Island in the Bay of Islands on the North Island of NZ, you can see the variation in each side of the coastline. In the middle, lush green grass and tall trees create an embankment for the beautiful turquoise colored bay and beach that makes up one side while the other is made up rugged rocks. On the serene side of the Motuarohia (Roberton) Island, boats moor in the shallow waters and enjoy a peaceful afternoon under the sunny skies of NZ. Here visitors can partake in fascinating underwater trails that are ideal for snorkeling or for those who prefer to stay above the surface, water skiing is incredible around this region of the North Island. Photo of the incredible view of Motuarohia (Roberton) Island Track in the Bay of Islands on the North Island of NZ. ... The Motuarohia (Roberton) Island Track on the North Island of NZ is about a fifteen minute hike that begins at the beach and then starts its incline up the centre of the island. 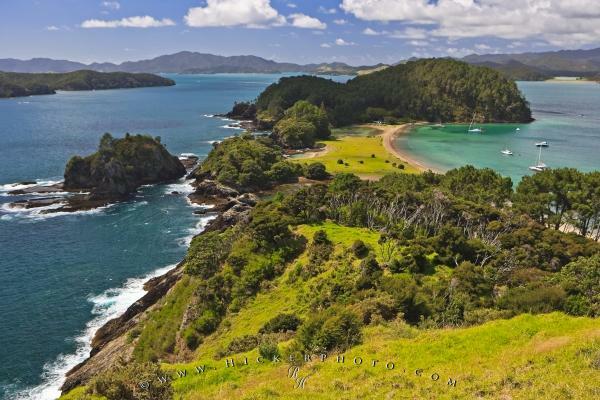 At the top, you can enjoy the spectacular scenery that surrounds the Bay of Islands. If visiting the North Island of NZ, be sure to stop at Motuarohia (Roberton) Island as there are endless outdoor things to do here as well you can take in the amazing scenery that the North Island has to offer.View over Motuarohia (Roberton) Island from the 350m long track in the Bay of Islands, Northland, East Coast, North Island, New Zealand. I photographed this photo with the digital SLR camera model Canon EOS-1Ds Mark II, aperture of f/6.3, exposure time of 1/100 sec. on ISO 100, as always I used a original Canon Lens, the focus lenght for this picture was 32mm.